BUT CAN THE WATER SECTOR LEAPFROG OTHER MARKETS IN TECHNOLOGY ADOPTION? In this age, digital is evolving so rapidly that it is hard to keep up with all of the emerging innovations. Two important questions to ask are: what impact does that have on the water sector? Can these technologies be adopted by water utilities at the same rate as other industries? Although there is an increase of digital adoption in water, the sector still lags behind other industries in digital migration. Some reasons cited for the slower adoption rate include the following: a risk adverse industry, aging work forces, and a fragmented market. All of these factors have an impact, but in order to change the current trajectory, a true understanding of the key barriers to adoption is needed. Amane Advisors, a business consulting firm specializing in the water sector, recently launched an initiative to help accelerate digital technology adoption in water. The initiative included qualitative and quantitative surveys of a hundred global leaders from water and waste utilities, technology companies, and water sector investors. These surveys yielded original insights, trends, and predictions on the digitization of the water sector. Currently, Amane is bringing together a group of fifty utilities from around the world to help accelerate digital technology adoption by working through the current challenges to help develop real, impactful solutions. The group will share experiences and best practices, while also working on key focus areas (agreed to by the group) which have not been addressed to date. A holistic approach will be taken, starting with digital strategy and looking at the modular (plug and play) integration of all the technologies towards end-to-end digital solutions for utilities. This collection of utilities is committed to showing in a few short years a two-hundred-million-dollar impact across the group through the various solutions implemented. This article shares some of the initial findings from the interviews. 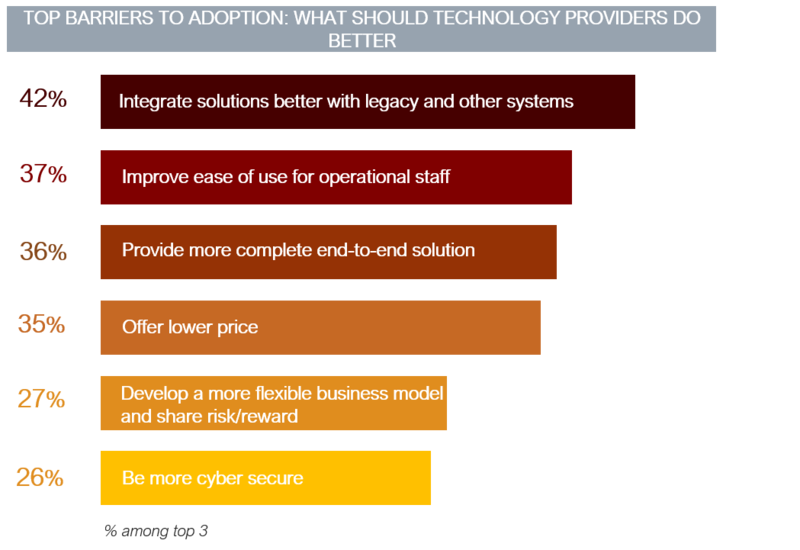 According to survey respondents, ninety percent of utilities do put a high priority on adopting digital technology (see Figure 1). Most utilities use a form of legacy digital technology for their current operations, such as the SCADA systems that in some cases are decades old. Some have added GIS systems, as well as mobile. Many utilities have implemented complete digital point-solutions for some of the costlier problems, such as pressure monitoring solutions to help identify network leaks or optimize pump schedules to reduce energy costs. In most cases, these are isolated solutions and the data is not shared across legacy systems or other point solution systems. Predominantly, these adopted solutions have met or exceeded the targeted ROIs (see Figure 1). However, while point-solutions do provide a good return on investment, if these solutions were integrated with legacy systems and other data sources, utilities could achieve additional savings. Utilities that start with an overarching multi-year strategy seem to not only gain the most from their digital technology investments, but also accelerate the rate of adoption of digital technology by having a framework of foundational technologies. The phrase ‘going digital’ means to use data in order to make more informed and optimized decisions. Data collection and analysis is accomplished using a set of technologies required for most end-to-end solutions. The key components of digital solutions include: 1) the objects recording the data such as sensors, meters, machines (pumps, digester, etc. ), 2) communications infrastructure, 3) data store, 4) data analysis, 5) a) decision point, in some cases, 5) b) control and automation. (see Figure 2). These are among the foundational, technology components needed for digital solutions in a utility. Overlying these technologies are people, process, and leadership geared towards innovation to take full advantage of digital transformation. Having a digital strategy outlining the goals and vision of the utility, that incorporates a timeline for technology infrastructure, innovative culture, and new digitally aligned processes are the key factors for a successful digital transformation of a utility. Climate change, population increases in urban areas, tightening of regulations, and water scarcity are some of the many global changes that water utilities will be forced to address in cost effective ways. While these drivers for change are pushing utilities for more efficiency, there is a technological revolution taking place. A new array of tools is available to help solve the challenges, including new low cost sensors, more efficient wide area network communications technology, inexpensive and secure cloud computing resources, powerful machine learning systems, and new business models surrounding SaaS. The intersection of the above global trends and the technological revolution could be an opportunity for the water sector to leapfrog other sectors in digital. The timing might be right. It is well understood that digital has the power to help water and wastewater utilities in many areas, including the following: engaging customers more closely than ever before, saving billions through operational efficiencies, improving service levels and reliability, and extending the life of aging assets. Survey results also show that most utility leaders feel that there is a wide selection of available digital solutions to choose from for most existing challenges (see Figure 1). Utilities around the world are implementing discrete digital solutions that provide leakage detection and recovery, back-office automation to improve efficiency, reduced energy footprint, improved asset performance and optimization, and prevention of sewage overflow events all while providing better customer engagement and overall experience. Although discrete digital solutions have been shown to have good ROI and positive impact, much more can be gained if data can be integrated across solutions. Some utilities feel that a good starting point for going digital is deploying smart meters or AMI (automatic meter infrastructure). This is an example of a digital solution in a water utility that usually leads to increased revenues and better customer relations. An impressive 38 percent of the surveyed utilities said that improving customer relationships is one of their top three priorities (see Figure 3). Significant improvements to overall customer satisfaction have been demonstrated when utilities deploy AMI and share data with their customers. It creates a level of transparency that usually leads to building trust. AMI allows utilities to remotely collect consumption data over short time intervals, such as every 15 minutes or hour, and in some cases even shorter time frames. Volumes of data is collected from households and businesses through flow meters and a wireless communication infrastructure in place of a single flow reading taken per month, quarter, or even longer periods. Today there are many utilities at the beginning of their digital journey that have implemented AMI, but have not yet unlocked the power of this data for anything other than normal billing. Conversely, others have taken full advantage of data analytics and combined it with user-friendly applications that result in better customer engagement. The same data set, when combined with additional data sources, can be used to improve operational efficiency. Empowering the customers by providing them with their own hourly usage data to better understand their bill, comparisons with like households to encourage conservation, instant leak alerts, and instant reverse flow alerts through two-way engagements has a significant impact on the customer experience. Additionally, detecting customer leaks, meter tampering, and failing meters can save the utility a large percent of revenue. 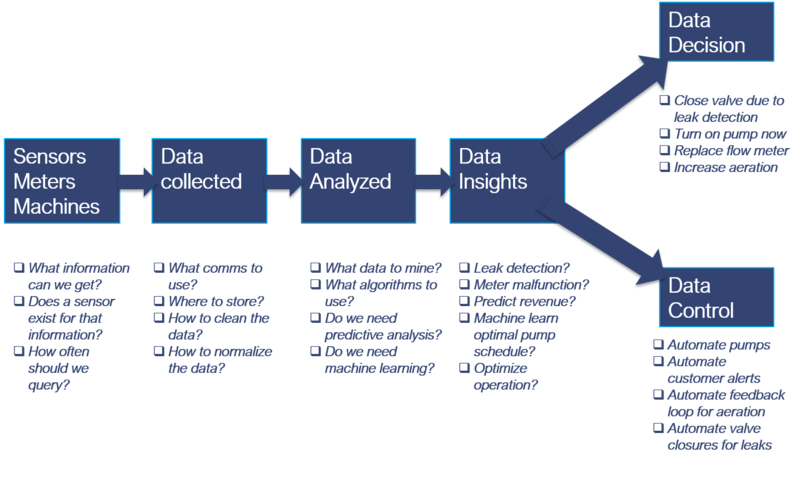 Further analytics can provide information on customer behavior, which some utilities have used to segment customers into tens of categories to tailor their engagement (e.g. : pool owners, renters vs owners, etc.). Combining AMI data with other external data sources such as weather or government available real-estate and census data can provide the needed insights to further help utilities recover lost revenue. Utilities can also use this data to reduce operational cost by determining water loss more efficiently by combining the AMI data with other sensors in the network such as pressure sensors to identify potential network leaks. Further use of the same AMI data could help optimize overall operation of the network if fed into a real-time hydraulic model. By unlocking the power of this large volume of flow data through data analytics, utilities can significantly improve their customers’ experience while increasing operational efficiency. In the above example, the same AMI data was analyzed in multiple ways, and combined a wide variety of data sources to deliver a range of useful insights, from customer behavioral profiles to network leak detection and operational efficiency. In most cases, however, it is difficult to maximize the use of varied insights due to the inability to access data from the different silos. In cases where utilities have a strong strategy plan and have put the required foundational components and infrastructure in place prior to adding the various data streams from separate digital solutions, data silos are not a problem. Nearly half of the survey respondents stated that the inability to integrate data across different systems is one of the top three barriers to technology adoption (see Figure 4). The true potential of digital transformation will be unlocked once data silos become a thing of the past. It is clear from the responses to the survey that utilities believe digital solutions can bring great benefits by improving service reliability, providing mechanisms for real-time event management, and extending the lifetime of assets. However, to accelerate adoption, technology companies need to pay more attention to integration with other systems, improve the user experience, and provide more end-to-end solutions. The data integration and access is really a mutual effort for both the utility to address with their infrastructure, and each technology vendor with their product offering. The use of cloud-based solutions can help simplify the data integration problem, however there are many utilities that do not feel that cloud-based solutions meet their requirement for cyber security. This seems to be a continuous debate between the different utilities, as some utilities will state that the larger cloud-based companies such as Amazon and Microsoft’s Azure, put millions more dollars and staff (security scientist) toward solving security issues than most utility IT departments, and therefore should be more secure. Addressing these challenges will help accelerate digital adoption in the water sector. 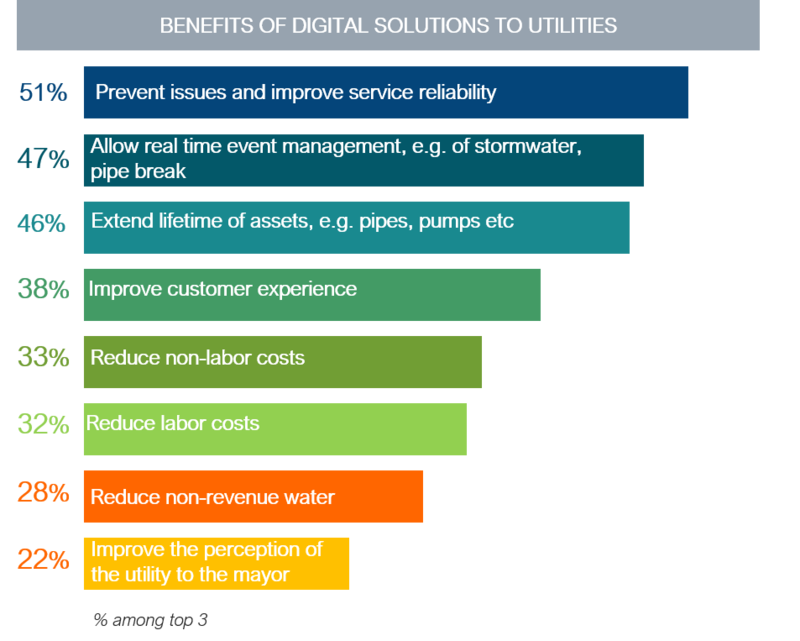 Digital has the power to help water and wastewater utilities engage customers more closely than ever before, save billions through operational efficiencies, improve service levels and reliability and extend the life of aging assets. There is an opportunity for the water sector to embrace digital transformation, but in order to increase adoption of digital technologies, the root barriers need to be identified and addressed. There is momentum moving in this direction, but the real breakthrough will come when utilities work together to share best practices and eliminate the identified barriers using truly implementable solutions. The digital utility group is designed to do just that and will greatly benefit the water sector as a whole.